Even if your current system with its cables, wires, and convoluted connections works, it’s time to cut the cord. Going wireless gives you many advantages and new options. So take the first step—get this book. Keith Underdahl is an electronic publishing specialist, network administrator, and freelance writer from Oregon. He has written numerous books, including 50 Fast Windows XP Techniques, Digital Video For Dummies, 4th Edition, Adobe Premiere Elements For Dummies, and more. Part I: Starting a Wireless Network. Chapter 1: Setting Up Wireless Access Points. Chapter 2: Configuring Your Network. Chapter 3: Adding Wireless Devices to Your Network. Chapter 4: Using Your Wireless Network. Chapter 5: Wireless Networking with Your Mac. Part II: Securing Your Network. Chapter 6: Activating Wi-Fi Security. Chapter 7: Managing Firewalls and Network Security. Chapter 8: Preventing Unauthorized Network Users. Part III: Improving Your Network’s Performance. Chapter 9: Monitoring Network Performance. Chapter 10: Improving the Speed and Range of Your Network. Chapter 11: Troubleshooting Network Problems. Part IV: Using Someone Else’s Network. Chapter 12: Finding and Using Public Hotspots. Chapter 13: Making Ad Hoc Peer-to-Peer Wireless Connections. Chapter 14: Using Bluetooth Devices. 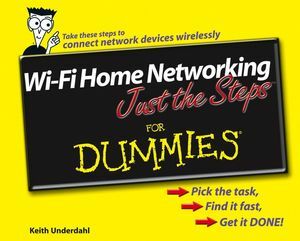 Chapter 15: Networking Wirelessly with Your Pocket PC. Chapter 16: Project: Creating a Network Bridge. Chapter 17: Project: Networking a Game Console. Chapter 18: Project: Setting Up a Wireless Media Center. Chapter 19: Project: Adding Wireless Network Storage. Chapter 20: Project: Connecting to a Digital Media Receiver. Chapter 21: Project: Turning Your Pocket PC into a Remote Control. Chapter 22: Project: Adding a Wireless Print Server to Your Network. Chapter 23: Project: Setting Up Your Own Hotspot. Chapter 24: Project: Voice Chatting With Your Wireless Network. Chapter 25: Project: Adding a Wireless Camera to Your Network.